For other people named John Cavendish, see John Cavendish (disambiguation). Sir John Cavendish (c. 1346 – 15 June 1381) was an English judge and politician from Cavendish, Suffolk, England. He and the village gave the name Cavendish to the aristocratic families of the Dukedoms of Devonshire, Newcastle and Portland. John Cavendish was descended from the Norman Robert de Gernon, who lived during the reign of Henry I and who gave a large amount of property to the Abbey of Gloucester. Robert's son, also called Robert de Gernon, of Grimston Hall, Suffolk, married the heiress of John Potton of Cavendish and obtained a landed estate in the lordship and manor of Cavendish. In consequence, his four sons exchanged their father's name for that of the estate each inherited. John was the eldest of the sons. Sir John Cavendish married Alice de Odingsells, became a lawyer and was appointed as a Justice of the Common Pleas in 1371 and Chief Justice of the King's Bench in 1372. As Chief Justice he was obliged to suppress the Peasants' Revolt in 1381. 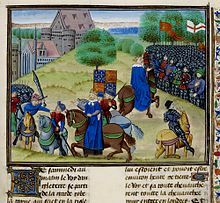 Although Wat Tyler, the leader of the revolt was struck down by William Walworth, mayor of London, during negotiations on 15 June, John Cavendish, the second son of the Chief Justice, gave the finishing stroke to Wat Tyler, the lord mayor having only wounded him in the neck. "Cavendish, John (d.1381)" . Dictionary of National Biography. London: Smith, Elder & Co. 1885–1900. ^ The father of Sir John Cavendish (senior) was not Robert de Gernon, it was Roger Gernon of Grimston Hall. Roger Gernon was born in Stansted in 1274. His father Geoffrey was born at the Gernon Lordhip of Bakewell in 1231. The first family seat of the Gernons was at Stansted Mountfitchet in Essex. They held the Lordship of Bakewell, Chatsworth which became the seat of the Dukes of Devonshire,that ran adjacent to Bakewell. The Gernons also held the Lordship of Lexden in Essex. Sir John Cavendish was born long before 1346, it was more likely his son, John who was born then. ^ Sir John Sainty (comp.) The Judges of England, 1272-1990: a list of the judges of the Superior courts (Selden Society: Supplementary Series 1993), 88.